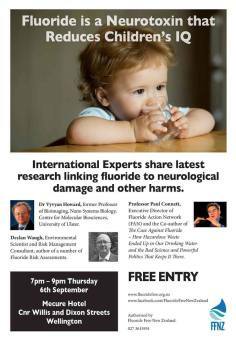 Sciblogs | Fluoridation: “debating” the science? The FFNZ advert shows this is the message the Three Wise Men were promoting in New Zealand. But the “latest research” they were “sharing” was not theirs but that of Basash et al., (2016). Or, rather, they were sharing a misrepresentation and distortion of that research to fit their scaremongering claims. A draft of my article critiquing the Bashash et al., (2016) paper, “Predictive accuracy of a model for child IQ based on maternal prenatal urinary fluoride concentration” is also available online. Neither of these Three Wise Men has performed any original research on community water fluoridation but they can still make their input via the peer review process – which includes post-publication peer review via critiques of published papers. But science does not gain one iota from Connett’s attacks on the New Zealander Broadbent and other researchers in the media or in his meetings with the faithful. Such attacks and macho comments, often bordering on ad hominem, only discredit the attacker. They are not the way to discuss science and yet Paul Connett and his supporters challenge genuine scientists to participate in such “debates’ which are nothing more than testosterone-laden slanging matches. So a farce, But wait. there is more. 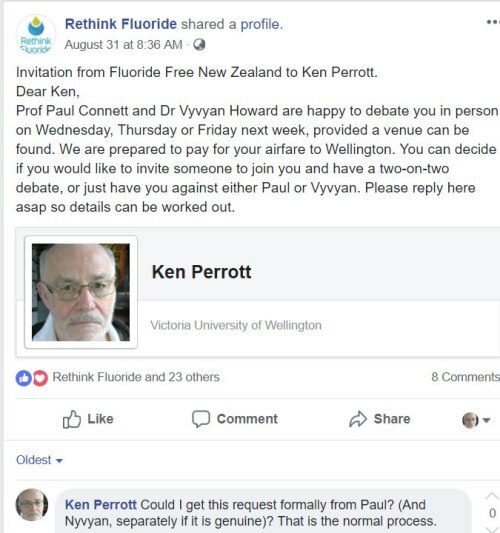 The Facebook page, Rethink Fluoride, deleted their invitation to this “debate”. They then followed by deleting all my comments on their posts. Rather ironic as I had a few days before congratulated them by allowing open comments, and in particular allowing scientific comments – something all other anti-fluoride Facebook pages refused to allow.